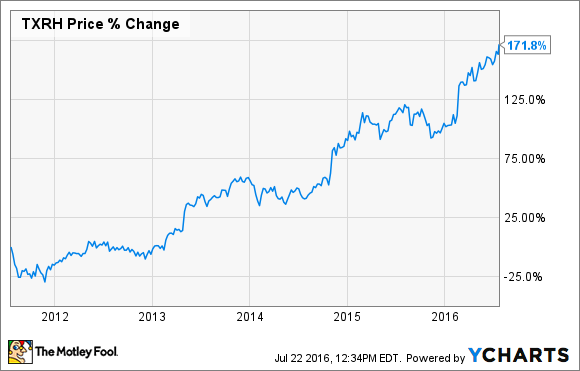 Can Texas Roadhouse's Stock Keep Climbing? The Southwest-style steakhouse has had an incredible run, and expectations are that the run will continue. Is it still safe to buy with shares near an all-time high? Shares of casual-dining chain Texas Roadhouse (NASDAQ:TXRH) have continued their seemingly unstoppable climb. In the past five years, the stock is up over 170%, driven by strong sales and profit growth. Can the momentum continue? Should investors load up on shares? The Texas Roadhouse -- based in Kentucky, of all places -- had 495 locations in the U.S. and abroad at last count. The company runs a mix of company-owned and franchised locations, as well as a new sports-bar concept called Bubba's 33. The company's success story revolves around a steadily growing number of locations and the strong traffic those restaurants consistently create. Over the past five years, total restaurant count has increased by 35%, and both foot traffic and the average customer bill have been rising each year as well. As a result, annual revenue is up 64% since 2011. What is the secret recipe behind all that growth? Texas Roadhouse cites its focus on mid-sized markets, which it has identified as the best-performing type of community for its restaurants. Locations tend to be around shopping and entertainment centers and target young and working class families. The large portions of food at a value has been a big winner in these key communities. Families and work commuters have also been lured in with the fun and friendly "Texas" atmosphere. The company isn't stopping there, though, as it has also seen a warm reception in the Middle East, Asia, and Mexico. In addition to its Texas-style steakhouse concept, Texas Roadhouse is exploring the sports bar theme with its new Bubba's 33 chain. Image source: Bubba's 33. After its multiyear string of success, is Texas Roadhouse due for a breather? Or will the business keep growing? Domestic restaurant openings continue to be the company's strategy. After opening 29 company-owned locations last year, Texas Roadhouse is set to do another 30 in 2016. At last report, part of the way through the second quarter of the year, the figure stood at 10 new company-owned locations and two new franchise locations. Included in the new company-owned locations is the new Bubba's 33 restaurant chain. In light of the success the sports-bar concept has seen in recent years from players such as Buffalo Wild Wings, Texas Roadhouse has decided to test the waters as well. Four new Bubba's 33 restaurants were opened in 2015, and seven are scheduled for this year. The total count for this new chain sits at only nine so far, but the company is starting to scale back new Texas Roadhouse openings and increase the number of Bubba's 33 openings. It remains an early stage concept, so the company is still experimenting to get the formula right. Though the average development for a new Bubba's 33 is about $6 million per location versus Texas Roadhouse's $4.8 million, Bubba's 33 totes substantially higher profit margins on food and drink. Management is not yet sharing specifics, so investors will want to stay tuned through the end of the year as the company gathers more data to report on its newest idea. International franchises continue to be a focus as well. The company recently opened its first location in the Philippines, and as many as six international franchises are expected by the end of the year. Texas Roadhouse has already brought its style to Taiwan, expects to open up in Mexico, and also has eight restaurants in three countries in the Middle East. The current agreement with its franchisee in the Middle East is to develop new locations in a total of nine countries by the end of the decade. Perhaps Texas-style cuisine in the Middle East sounds a little odd, but Texas Roadhouse is making a decent run at changing that perception. The company's 17% increase in franchise royalties and fees last year is proof. Texas Roadhouse is set to keep growing, and that should make investors excited. Analysts expect sales to grow about 12% and profits to grow 28% this year and for profits to average 19% growth in each of the next five years. We might assume that such an aggressive expected growth rate would fetch a high valuation, but Texas Roadhouse currently fetches a PEG ratio of 1.4. The PEG ratio measures the current value of future growth, and a PEG greater than 1.0 typically denotes a premium, whereas lower than 1.0 indicates a discount. A PEG of 1.4 would currently suggest a slight overvaluation for Texas Roadhouse. That said, if the company continues along in its solid growth trend, that premium will soon be erased. Even though the stock is trading near its all-time high, I still think the casual diner is a good purchase for the long term.